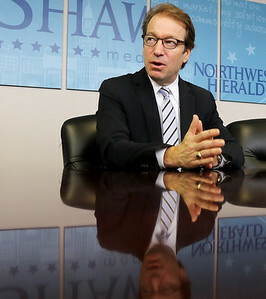 Matthew Apgar - mapgar@shawmedia.com US Representative Peter Roskam of the 6th congressional district meets with the editorial board at the Northwest Herald on Thursday, Feb. 22, 2018 in Crystal Lake. 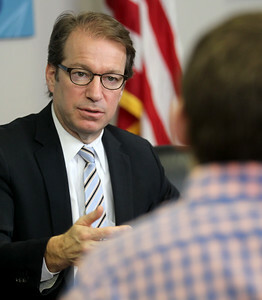 Among topics Roskam addressed were the tax code, the opioid epidemic, and gun control. 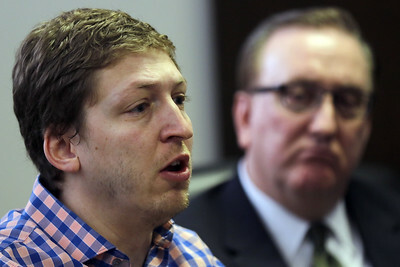 Matthew Apgar - mapgar@shawmedia.com US Representative Peter Roskam of the 6th congressional district responds to a question from sports editor Kyle Nabors during an editorial board at the Northwest Herald on Thursday, Feb. 22, 2018 in Crystal Lake. Among topics Roskam addressed were the tax code, the opioid epidemic, and gun control. 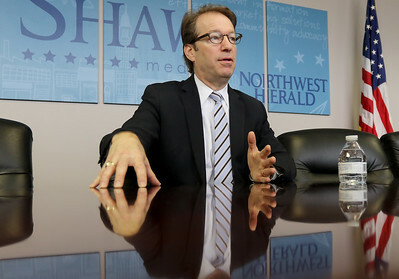 Matthew Apgar - mapgar@shawmedia.com US Representative Peter Roskam of the 6th congressional district meets with editor Jon Styf during an editorial board at the Northwest Herald on Thursday, Feb. 22, 2018 in Crystal Lake. Among topics Roskam addressed were the tax code, the opioid epidemic, and gun control. 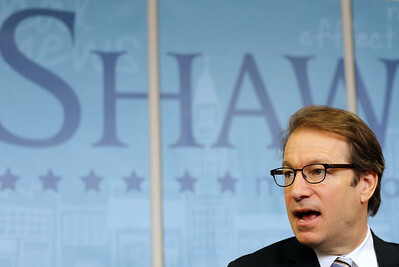 Matthew Apgar - mapgar@shawmedia.com US Representative Peter Roskam of the 6th congressional district responds to a question from city editor Hannah Prokop during an editorial board at the Northwest Herald on Thursday, Feb. 22, 2018 in Crystal Lake. 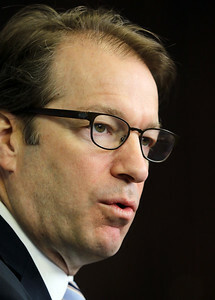 Among topics Roskam addressed were the tax code, the opioid epidemic, and gun control. Matthew Apgar - mapgar@shawmedia.com Sports editor Kyle Nabors (left) and General Manager Jim Ringness (center) listen as US Representative Peter Roskam of the 6th congressional district responds to questions from the editorial board at the Northwest Herald on Thursday, Feb. 22, 2018 in Crystal Lake. 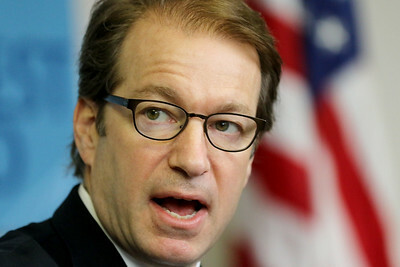 Among topics Roskam addressed were the tax code, the opioid epidemic, and gun control. Matthew Apgar - mapgar@shawmedia.com City editor Hannah Prokop (right) listens as US Representative Peter Roskam of the 6th congressional district responds to questions from the editorial board at the Northwest Herald on Thursday, Feb. 22, 2018 in Crystal Lake. 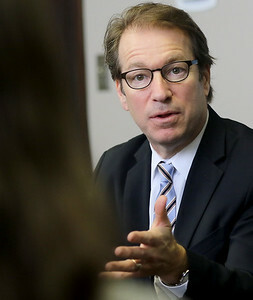 Among topics Roskam addressed were the tax code, the opioid epidemic, and gun control. 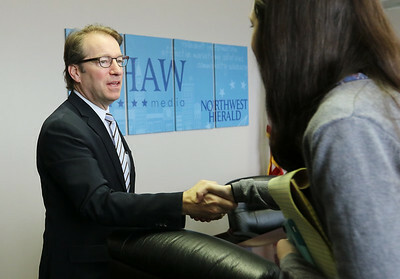 Matthew Apgar - mapgar@shawmedia.com US Representative Peter Roskam of the 6th congressional district shakes hands with city editor Hannah Prokop (right) after an editorial board at the Northwest Herald on Thursday, Feb. 22, 2018 in Crystal Lake. 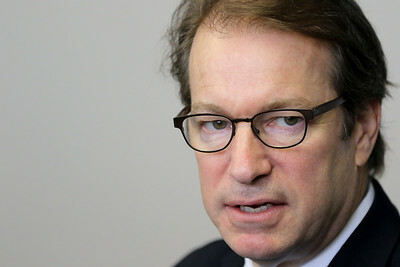 Among topics Roskam addressed were the tax code, the opioid epidemic, and gun control. 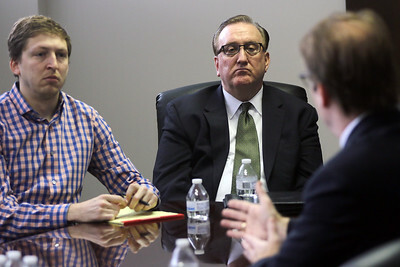 Matthew Apgar - mapgar@shawmedia.com Sports editor Kyle Nabors (left) and General Manager Jim Ringness pose questions to US Representative Peter Roskam of the 6th congressional district during an editorial board at the Northwest Herald on Thursday, Feb. 22, 2018 in Crystal Lake. Among topics Roskam addressed were the tax code, the opioid epidemic, and gun control. 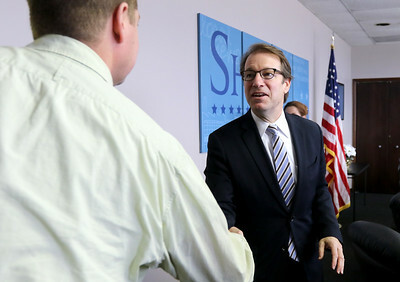 Matthew Apgar - mapgar@shawmedia.com US Representative Peter Roskam of the 6th congressional district shakes hands with editor Jon Styf after an editorial board at the Northwest Herald on Thursday, Feb. 22, 2018 in Crystal Lake. Among topics Roskam addressed were the tax code, the opioid epidemic, and gun control. 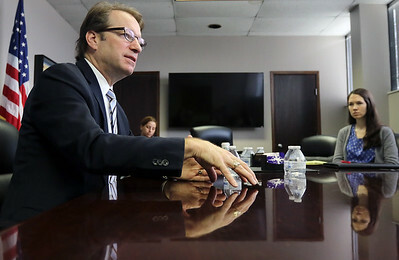 US Representative Peter Roskam of the 6th congressional district meets with the editorial board at the Northwest Herald on Thursday, Feb. 22, 2018 in Crystal Lake. 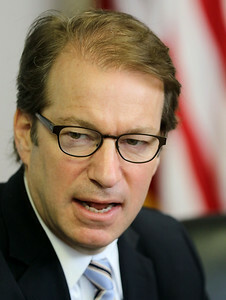 Among topics Roskam addressed were the tax code, the opioid epidemic, and gun control.